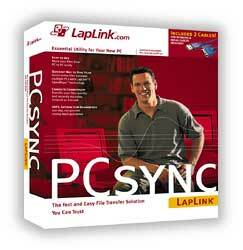 PCsync is one of LapLink's newest solutions for moving files efficiently between PCs via serial cables. But in this age of high capacity removable media and Internet file servers, why would you want to do that? The answer is quite simple - to save time. OK. You want to move 5 megabytes of files from your Windows 95 PC to a friend’s Windows 98 laptop. Pretty simple - well, it should be. You are simply moving data from point A to point B, but you don’t happen to have a network between your two machines. While you could use your trusty Iomega Zip drive, you then need to install the Iomega drivers on your friend's machine and uninstall them when you are done. You will also end up doubling your copying time, because you have to copy the data to the media, switch the drive and media over and then copy it to the second computer. What happens if your friend is now 1,500 miles away instead of in front of you? The rules change. Now you have to use a different tool - maybe a Web storage service or an accessible FTP server. While you may know exactly how to use these tools, your friend will now ALSO need to be proficient with them as well. Ever try teaching someone to use FTP over the phone? Assuming you are still talking (it can cause heated “discussions”) and your friend can actually can access the data, you still have doubled the transfer time and that’s not counting the training time. There is still an intermediary device involved. Wait a minute - we have altered our transfer method based on the distance between the two parties. Both of you now have to be proficient in the tool, install software driver or nothing happens. We end up doubling the transfer time. There HAS to be a better way. That’s why PCsync is useful. You can transfer files the same way, whether the two computers are next to each other or on the other side of the world. If you get the software installed on the remote end, you can “push” the data to your friend's computer - your friend doesn’t have to know how to operate the software. PCsync can even do more than just copy files from point A to point B. You can synchronize folders and even create your own mini-home network with complete security. This $79.95 package includes not only the software application and drivers, but a serial cable and a USB Network cable. The cables are used to connect the two computers. If you need to transfer data files between a Windows 95 machine (without USB) and a Windows 98 machine, and you find the serial connection is just too slow, go parallel with LapLink Gold. LapLink Gold is LapLink’s premier remote access software that also includes remote control capabilities along with three cables. You can also run applications remotely, schedule synchronizations, collaborate via text/voice chat and even print documents directly to remote printers. Wow - now you can “e-print” a file to someone - instead of faxing! utilizes SpeedSync technology. This patented method compares stored files in multiple locations, calculates the byte-level changes and then transfers only the new data. This significantly speeds up the transfer process and saves time. requires only 8 MB of RAM and 10 MB of hard drive space and serial or USB port. For parallel connections, use LapLink Gold. supports Windows ME, 2000, 98, 95 and Windows NT 4.0.